Instagram is testing a new feature that allows users to tag friends in videos (via TechCrunch). The option uses the same icon that users normally tap at the bottom left of tagged photos, but instead of overlaying the content with tagged names, the button links to a separate page listing all the people tagged in the video. 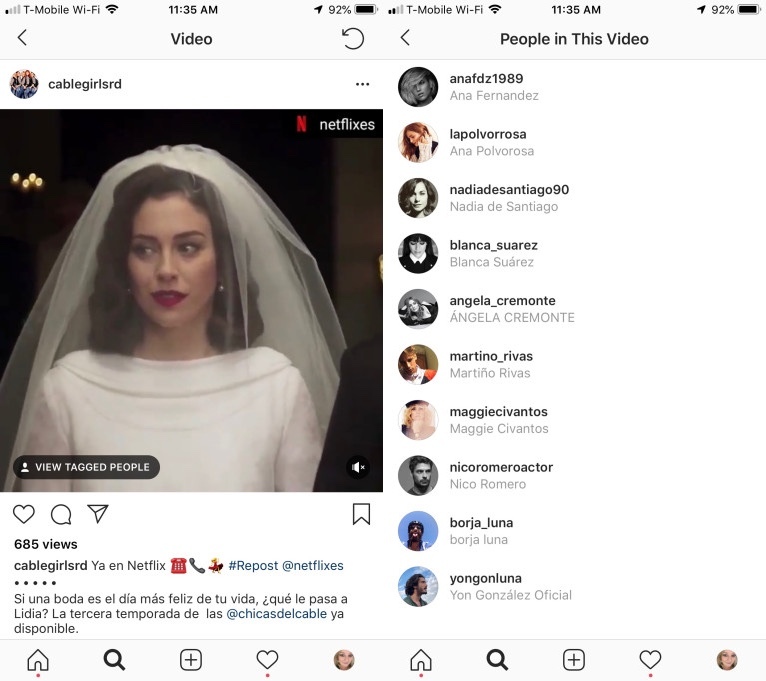 The new page, titled "People in this Video", also lists users that the original poster wants to notify of the shared content. As it stands, the videos don't copy over to the tagged users' profiles like tagged photos do, but that could change if Instagram opts to roll out the feature globally in future. Video tagging only appears in the mobile app right now, so it won't show up for anyone using the web version of the social media platform. Instagram also confirmed that the feature is currently only available to a "small percentage" of users who specifically opted in to test video tagging. Photo tagging has been possible on Instagram since 2013, with the feature having since been extended to support additional usage scenarios, such as product tagging and tagging friends in Stories. Video sharing was introduced later the same year, but the ability to tag people in them has been missing thus far. TechCrunch notes that the introduction of video tagging could drive additional engagement on the platform and usher in a spate of "shoppable videos" that could enable users with a large following to share videos promoting their favorite products, places, and brands more easily.